While numerous rumours had 3GB RAM slated for the Note 3, a tweet from @evleaks is "confirming" that a screenshot showing Note 3 specs – which shows that the handset has only 2.5GB of RAM – is real. Though it is only a 500MB bump down in RAM, this is one of the first rumours we've seen of a RAM-spec drop down for the device as nearly all previous Note 3 rumours agreed on 3GB. The screenshot also shows that the smartphone is powered by Android 4.2, and an Antutu benchmark screenshot gives the device a score of 24,497. Another report, from G for Games, is confirming that at least some Galaxy Note 3 models will be sporting a Snapdragon 800 SoC processor and LTE-A. According to the report, a slide from a press conference hosted by KT Telecom (Korea Teleocm) showed the Galaxy Note 3 alongside the LG G2 and the Samsung Galaxy S4 LTE-A as it spoke about LTE-A technology and Snapdragon 800 SoC. While rumours of the device and this processor has been prevalent over the last few months, it seems like this report is as close to an official confirmation we'll be getting before Samsung's announcement at IFA 2013. It won't be long before we know the truth about the phone's specs, so it's still probably best to take both "confirmations" with a grain of salt until then. 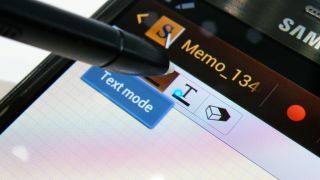 TechRadar will have all the details from Samsung's Unpacked event, but until then, why not check out our round up so far of all the news and rumours from IFA 2013 and what we've gathered so far about the Galaxy Note 3.